What Is Link Aggregation and How Does It Benefit Your Device? provides redundancy in case some of the links fail. A typical link aggregation implementation is usually associated with expensive hardware devices. These include enterprise-grade routers, switches and other networking equipment. You’re looking at least at some hundreds of dollars out of your budget. Nowadays, smart link aggregation software apps do exactly the same thing as a link aggregation router, only for a fraction of the price. Meet Speedify – the secure link aggregation router software app! It works on Android, iOS, Windows and macOS devices, with no need for bulky, expensive hardware! Speedify is a faster mobile alternative to traditional link aggregation routers from companies such as Avaya, Cisco, Juniper, Synology and others. Find out more below! Flexibility: Unlike more expensive link aggregation hardware, Speedify’s channel bonding technology is software-based. It uses fast cloud servers which act as a middleman between you and the rest of the Internet. No more outdated link aggregation routers that need to be replaced every couple of years! Cost-effective scalability: This is a direct effect of Speedify’s link aggregation architecture. Being software only, it can be deployed very easily both on clients’ devices and on providers’ existing infrastructure. All this at only a fraction of the costs you would normally see with link aggregation routers. Security and online privacy: Speedify has VPN capabilities and securely combines multiple Internet streams. You can be sure no one can eavesdrop on the online traffic being aggregated. All the private browsing data is safe. within third party apps, via the bonding SDK. When running, the Speedify client software identifies all available Internet connections on your device in real time. You can add or eliminate them while running – Speedify will get that and adjust its link aggregation algorithms. It “routes” all of them into a virtual network adapter. 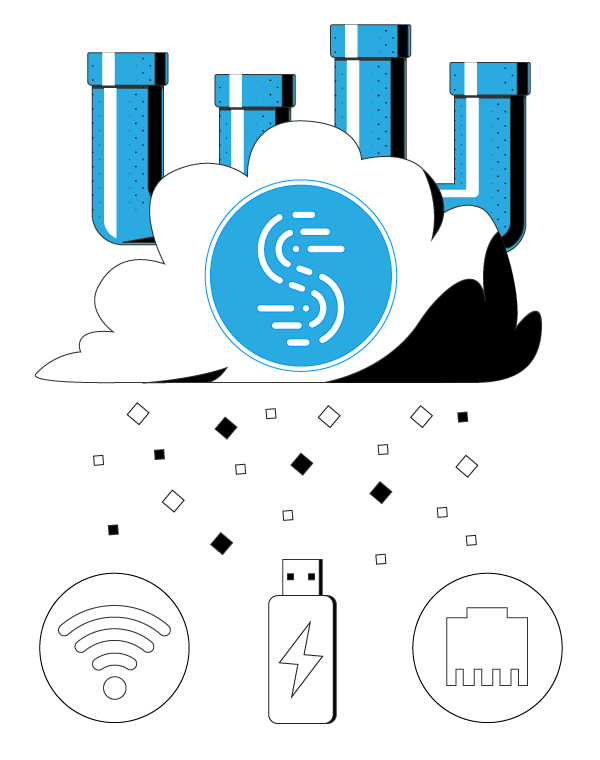 The Speedify client establishes a secure and encrypted connection to a speed server in the cloud. That acts as a middleman between you and the rest of the Internet. The server can be either public or a dedicated one. Speedify works in tandem with the speed servers in the cloud. They intelligently divide your Internet traffic and deliver the combined speed of all available Internet connections. Speedify monitors the quality of your connection in the background. If one of your connections becomes unstable, the app’s got automatic failover . 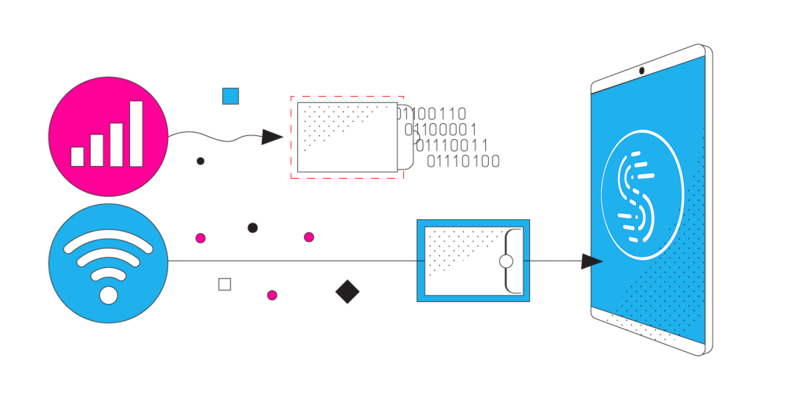 The mechanism reroutes all of your data so that you stay connected and don’t miss a beat. Once the lost connection is available again, Speedify starts to utilize it. Speedify also works to encrypt all of your data, as a fast bonding VPN solution. This keeps you safe from hackers and snoops. may go lower if there is huge difference in latency between the connections. For example – see below a recent video where we combined 10 Internet connections at once. let’s assume we’re combining an Ethernet link with a WiFi network. The real transfer rate of the Ethernet network is 95 Mbps and the WiFi does 45 Mbps. The theoretical link aggregation rate is 95 + 45 = 140 Mbps. However – the real rate is lower, but with Speedify you should get up to 95% of that = 133 Mbps. When it comes to connections with packet loss Speedify often speeds things up dramatically. Combining 2 connections with 5% packet loss, Speedify increases the bandwidth of the resulting connection by 300%, compared to running a single connection without Speedify. Interested in the Link Aggregation Router Software Alternative? Get Speedify on your computer or smartphone and test it yourself. We also offer professional services to businesses and network operators. Including the ability to use the Speedify link aggregation router software solution in your own platform. Don’t spend thousands when you can spend a fraction of that and always be up to date with the technology!